With one of these http://www.rmcpickup.com/fanoutbox.html you can extract the 6 audio streams from your hex pickup. Also you can send 6 channels of audio to a GK compatible device. Using this you can not only re-amp but also re-guitar using one of the VG units. Cool! Instead of stereo, we now have hexeo, or is that sexeo? Its Hexaphonic, although Sexaphonic sounds fun. I have a Fanout box and originally I got it to try to create a guitar synth like the Roland GR300, of course like all my plans this never got anywhere. Currently it isn't connected up but I am going to be sorting all my gear out soon (when my new racks arrive) and I have a spare motu 828mkii hanging around so I will probably connect it up to that and start playing with it again. The SoundBite Dev Board I have may come into play as it has 8 inputs and could handle the job quite nicely, if only I had the time and ability! that box is cool. thanks for the link. Alright, now having six channels of audio is way cool to me, but what are you going to do with them? I tell you what I would do, I'd do the lower two strings on thunder effect and the middle on drums and the upper on cymbals. That way when you play you can really jam out! The upper three strings dirty and the lower chorused clean.. that's the first thing comes in mind. I'm getting curious about this box, how's the splitted audio quality compared to standard pickups ? Well the audio is dependent on the type of Hex Pickup you have on the guitar. You do not get the same sound as you would from a normal guitar pickup, for a peizo hex pickup on an electric you get a pretty thin sound. 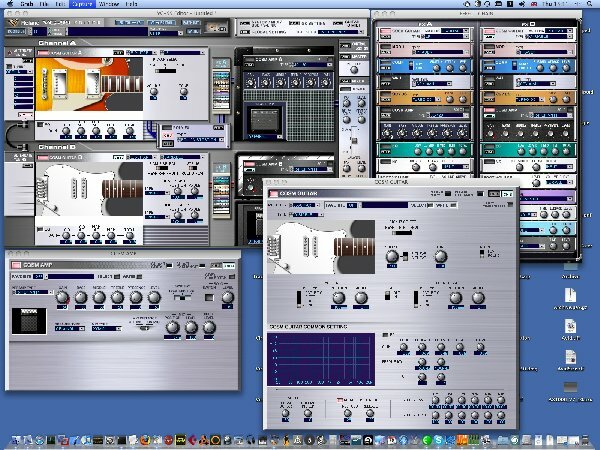 You can have two emulations running, each with its own FX chain and amps, you can also change tunings, emulate 12 strings etc. You can also set up your own guitar, in the image yiou can see I have set one up with two single coils out of phase with each other. So with the Fanout box I can record the 6 channels of audio along with the audio from the VG99 (say a clean strat), a bit latter I may say I wonder what this will sound like using a LP rather than a strat and then send the 6 audio tracks to the VG99 and setup a dirty LP instead. Posted: Thu Oct 16, 2008 9:25 am Post subject: How are you getting the audio into your computer? I recently purchased a hex pickup from someone on the tapeop message board* and am in the process of building the guitar but I still haven't figured out how to actually get the audio into my mac. What I want is 6 instrument inputs, firewire output, and the capability to assign each input to a different audio track in Logic Pro. This would give me the capability to capture each individual string's output as a separate audio file in one pass, and then process/mangle each separate audio track as desired. It looks like the MOTU 8pre will fit the bill, are there any others that might come in at a lower price point? Or can I use the line-in inputs on any other interface? My understanding is that the guitar pickups need to be run through an instrument preamp, you can't just plug them into a line in input because there isn't enough gain, is that correct? *: http://messageboard.tapeop.com/topic-55820.html , they're now $80, http://messageboard.tapeop.com/topic-58987.html and a very good deal. I don't officially speak for the seller, just a satisfied customer. Well you could try using line inputs and then amplifying in logic you may run into noise problems. Probably worth a try if you already have an interface. I am pretty sure that the fanout box doesn't have any amplification in it and I had that connected through a motu 828 before and got ok levels. I am going to connect it up again over the weekend and will let you know. I tried my regular guitar into the line-ins, that worked although of course the level was pretty low. That gave me the idea though to just build a DIY 6-channel instrument > line level preamp. I googled for schematics and found a few possibilities. Yes, it'll open up new wonderful possibilities for guitar. Is VG99 a physical modeling device ? So i guess the audio is only providing the pitch/volume info..
RMC doesn't have the new fanout boxes in stock yet. Does anyone happen to have an old one laying around to sell? They rarely pop up on ebay and tend to go quick. Yes, the VG-99 is a physical modeling device. Models include guitars, amps, synths, stompbox pedals, etc. It comes with a software suite as well. A musician who has both a VG-99 and a StringPort w/laptop would be quite dangerous. That StringPort looks pretty interesting. It doesn't seem to offer the flexibility of the RMC device for sending audio data to 13 pin devices but it has the massive advantage of not needing a bloody great snake and a 6 input audio device and it looks like there is some MAX/MSP analysis stuff in there as well. I might just get one. Hi I'm a newbie and just came across your thread about the RMC Fanout Box They are really brilliant enabling you to multitrack record each of the HEX guitar strings and play them back as individual strings into you guitar synth, i.e. GR-1 GR-20 or alike. you can then process and edit each strings recording and correct errors. Not being a lead guitarist I was always frustrated that I couldn't do a fast enough lead line to output the note to digital tracks and then turn them into real TABS rather than the made up ones you buy. Unfortunately the aged hands are a bit too stiff to take up lead so I haven't used the RMC since I bought it and have now put it on ebay. The other great thing is the ability to drive say a VG-8ex and a gr-20 at the same time. The fixed1t name came about as i love resurrecting old and sick synths and getting their voices back to their original glory, like playing a ukelele in an old folks home. Yep, I'm quite interested in re-synthesis of the hex audio on the Pacarana. Also as a poly fx box especially using the timeline triggered by an envelope follower or midi. The Konnekt has arrived so I will set up that side of things over the weekend. The Pacarana should be arriving in the second week of April. Well the first phase is setup, the Konnekt48 is connected to the RMC Fanout box and over ADAT to the Fireface and then onto the mac. Had a little play putting echoes with different timing on each string in Ableton Live and then passing the sum to a compressor and then through a clean Waves GTR Amp with a warm sort of setting. So for people that are wondering this is from a piezo pickup from RMC on a Brian Moore i91.13. Dang! I wish I could play guitar like that! Wow! I cant wait to hear where you take it. Now you can get REALLY deep into things!